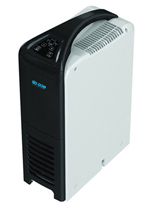 The Eco Air Dehumidifier range is part of a wider selection of products employing similar technologies carrying the Eco Air brand. 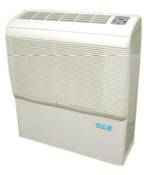 These include air conditioners, air purifiers and heat pumps. The ECO8LDN is a lower capacity model suitable for smaller areas of your home. It is quite compact so if space is tight in your flat or house this Eco Air Dehumidifier may be the right choice for you. All of these appliances make some noise but the ECO8LDN is quieter than some more powerful units, with a noise output of 43dB. The ECO8LDN is economical to run consuming 230 watts per hour, about the same as three 60 watt light bulbs. For slightly larger areas in your home, up to 17 square metres, the ECO10LDN provides 10ltr per day of water extraction. 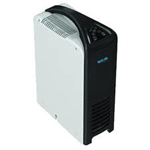 In most other respects this Eco Air dehumidifier is nearly identical to the ECO8LDN. It shares the slim profile, low noise output and economy of operation of the ECO8LDN together with electronic controls and a Hepa air filter. If you need even more power you might wish to consider the ECO12LDT. This unit extracts up to 12ltr per day and will control humidity in a one bedroom apartment or a single large room. If you prefer to keep things simple you will like the straightforward and intuitive manual controls on this Eco Air dehumidifier. Useful features include the capability for continuous drainage and auto-restart following a power supply interruption. The ECO20LDT is a higher capacity unit which will extract up to 20 litres of water per day from the air. 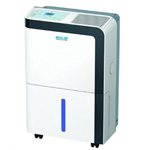 The capacity of this Eco Air dehumidifier is large enough to control humidity in an area of up to 30 square metres. The ECO20LDT shares its styling and structure with the ECO12LDT but is larger overall to accommodate a bigger refrigeration system and other parts. The ECO20LDT has manual controls and the same features as the lower capacity ECO12LDT. The ECO14LDF is a medium capacity unit capable of pulling up to 14ltr of water from the air every 24 hours. You will find this model effective in a large room of your house or a small flat not exceeding 20 square metres in area. The ECO14LDF is more modern in appearance than the "DT" range and includes electronic controls rather than a simple rotary dial. 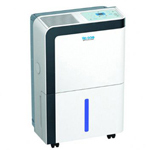 This Eco Air Dehumidifier is compact and weighs 10.5kg. It has a carrying handle and most people will find it easy to move from room to room if required. 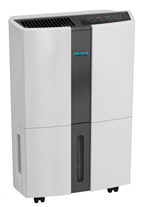 The ECO20LDF is a 20 litre unit and is the "big sister" to the ECO14LDF. Suitable for areas of up to 30 square metres the ECO20LDF is a physically larger and heavier appliance but otherwise similar to the ECO14LDF. A downside of the greater power is that the ECO20LDF is noticeably louder than the ECO14LDF, 50dB vs. 45dB, so may not be the best choice for use in your bedroom. Both "DF" models are configured for continuous drainage and will restart automatically after a power cut. The ECO14LDG offers some modest improvements over the ECO14LDF and is priced a little higher. The ECO14LDG has a 14ltr daily capacity and is recommended for medium sized areas of around 20 square metres, about the size of a fairly spacious living room. One of the improvements is a reduction in noise level, about 2db, although most of us would have difficulty in detecting the reduction with our ears alone. 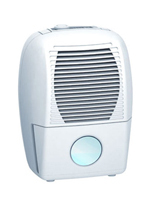 This Eco Air Dehumidifier is compact and portable. It has both carrying handles and castors so can be moved easily between rooms if needed. The ECO20LDG is the 20 litres per day equivalent of the ECO14LDG. As you might expect the ECO20LDG is bigger, noisier and weighs more than the less powerful model although in all other ways it is very similar. This is the model you need for a large lounge-dining room, or any other space of up to 30 square metres. Like all Eco Air refrigerant models the ECO20LDG is designed to operate at typical room temperatures and is not suitable for use in cooler conditions. 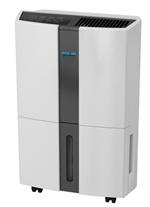 The ECO20LDK is another 20 litre Eco Air unit and you may be wondering why yet another model is included in the range. The ECO20LDK is larger overall than the other 20 litre models but this is to allow for a larger water collection bucket, 4.5 litres. For those of you who cannot use continuous drainage this reduces the number of times you have to empty the bucket. A second advantage is that the ECO20LDK is significantly quieter than the other high capacity models in the line-up. The noise level ranges from 36 to 43dB compared with the 50dB of the other units. You will notice the difference! In other respects this unit is comparable to the other 20 litre Eco Air models and will manage an area of up to 30 square metres with ease. The Eco Air DD122FW is quite different from the other portable models in the Eco Air range. Because it uses desiccant technology it does not need a compressor. As a result the DD122FW is smaller, lighter and a little quieter than a refrigerant unit. The main advantage of the desiccant type is its ability to function effectively at temperatures just a degree or two above freezing point. The disadvantages are a lower water extraction rate at normal room temperatures, higher energy use and the generation of odours from air pollutants, such as tobacco smoke, captured in the desiccant material. The DD122FW is ideal for use in your garage or boat in cold weather because it will be effective when a refrigerant type will not. The running cost, smell and low water extraction rate at room temperatures make it less suitable for use in your home. The ECOD850E is deigned for use in a swimming pool. It has a 45 litre per day water extraction rate and is suitable for small pools and spas plus a variety of commercial applications. This Eco Air dehumidifier is protected against water splashes and penetration by small items, both essential in a pool environment where young children are likely to be present. 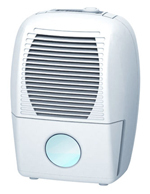 The ECOD850E may be mounted on the floor or wall mounted. Sets of feet and wall mounting brackets are provided to suit either option. The ECOD950E is a commercial unit configured for environments where there is high humidity and the risk of water splashes. These include swimming pools, hydro-therapy units and certain manufacturing facilities. The ECOD950E is similar to the ECOD850E but has a larger water removal capacity of 60 litres per day. 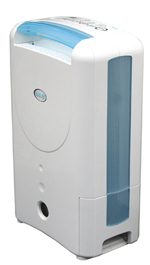 This Eco Air dehumidifier is quiet for a model of its capacity which is essential in public areas. The ECOD950E is not configured for ducted installation and must be installed in the drying area.